These terms refer to the thickness of the gum. It does not refer to a healthy vs. non-healthy gum, but it only describes what type of gingiva (gum) Mother Nature has given us. Having said that it is important to realize how the thickness of gums can impact our oral health, teeth or dental implants. A simple way to define it, THIN gum is bad and THICK is good. Simply because Thin tissue can be stretched causing recession around teeth and dental implants, while a THICK gum is firm, bound to the underlying bone and protects teeth and dental implants. Even during smiling, eating and talking the facial muscles will stretch the gum causing recession, something that you might not even be aware of. Roots are not covered with enamel and hence they are softer. When the roots are exposed, they wear much faster during normal daily brushing. This makes you get cavities easier on exposed softer root surfaces, when compared to hard enamel covering the crown. When doing any restorations (Crowns, Veneers or fillings), periodontal surgery, surgical placement of a dental implant etc. thickness of the gum influences the healing, and the long term outcome. The ticker the gums are, the more they resists any irritation and the healthier they remain long term. What can be done if one has THIN gums. 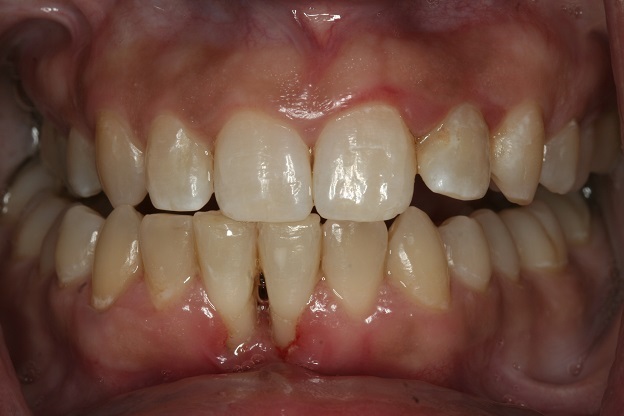 Gums can be grafted to change its appearance. Different sources for Gum Grafts are from patients own mouth (usually palate) or from a tissue bank (cadaver). For those who do not like the idea of taking tissue from their palate, Cadaver soft tissue is a better option since it eliminates the donor site on the palate. Gum Graft used to covered the exposed and discolored part of the tooth (Canine/ single site). 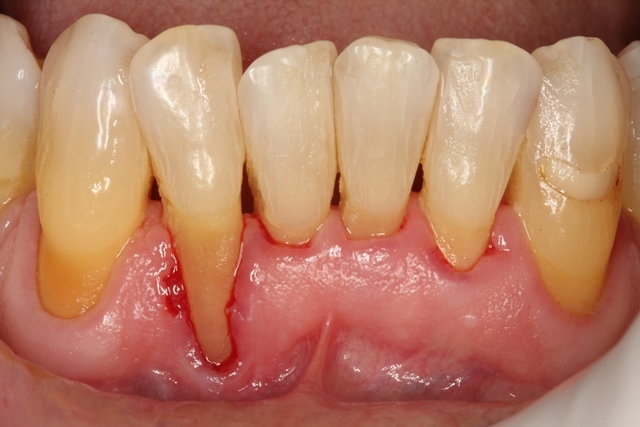 Gum Grafts can also be done in a single visit to build up thick tissue and cover exposed roots of multiple teeth. By thickening the soft tissue the risk of recession is minimized, saving you several fillings, teeth sensitivity, cavities, etc. in the future. The case presented below is an example. 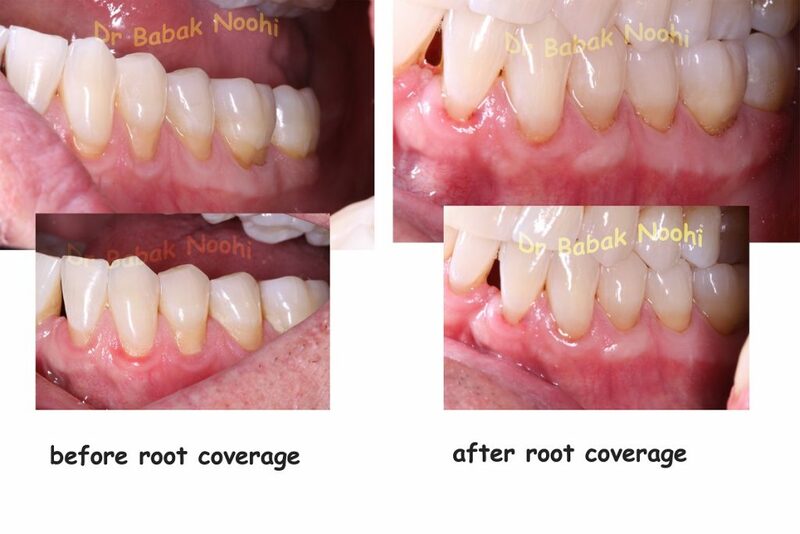 Root coverage of multiple teeth. There are times gum recession happens despite the fact that there is a relatively thick gum. These are instances that other anatomical factors adversely influence the health of the gum. Below is an example. This recession can reasonably be improved with Gum Graft. The sooner you treat the site the more predictable the root coverage will be. Gum Grafts before orthodontic treatment in people with thin gums is a common practice and will help your teeth stay healthy and beautiful . 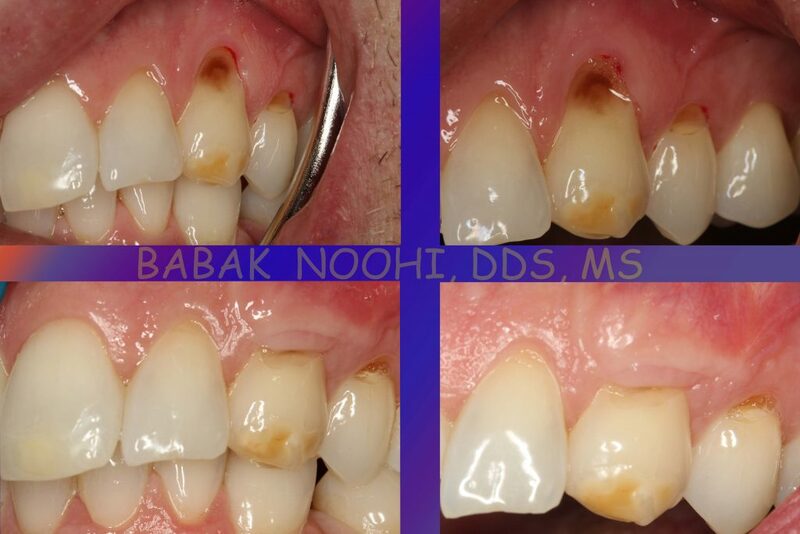 Root Exposure Due to Gingival (Gum) recession. Gum Grafts can also be used to PREVENT further recession. It is not uncommon to perform gum (gingival) graft before orthodontic treatment, because teeth movement accelerate recession. If you are thinking of getting braces or invisalign, have your gums checked to make sure you won’t worsen the situation.